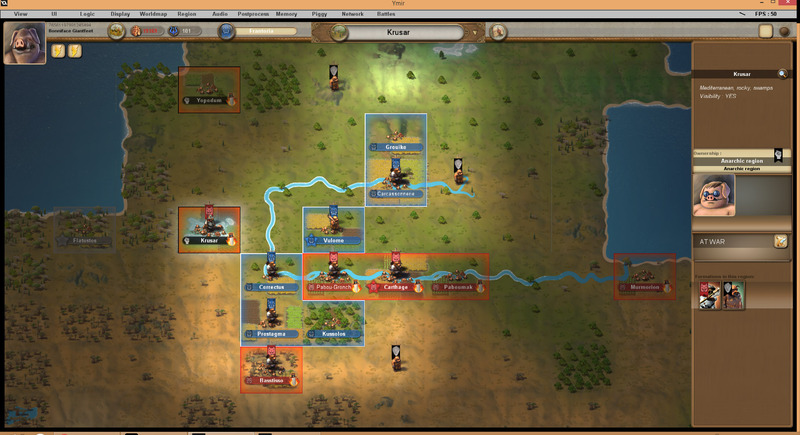 The work on the battle system is pretty much done, as you could see in the 2 previous video news. However, although the system is complete, its still full of bugs and issues because of the large amount of possible battle situation: every region being different and all. So every time i test a different kind of battle , new bugs and issues arise. During these past months i’ve spent quite some time fixing bugs and problems regarding the battles, and it will probably be a never ending task. I also played a first Ymir ‘alpha2’ game with 2 friends for about 40h in ‘realtime’ mode. That helped me find lots of bugs but also to diagnose the priority of the different gameplay issues. We developed 3 kingdoms next to each other in peace, until Krusar made the mistake to move his armies to have a look at the capital of Pokie, probably expecting to impress him by the number of his troops. What he didnt expect is that the treacherous Pokie was rising an army twice this size in secret, planning to attack us both. As the secret was out, he instantly declared war and marched on the capital of Krusar, before the armies of Krusar could go back to defend it properly. The defense being disorganized, the city fell. 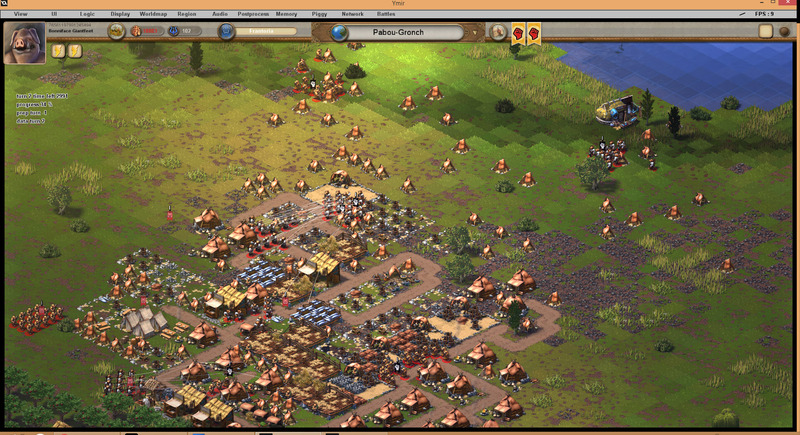 As for me, I had pretty much no army to fight back and the capital of Pokie was well defended with a huge garrison. The game was stopped after that battle because key gameplay factors needed to be implemented to fix balance issues. The main issue is that porcos in armies are ‘out’ of the demographic system. They become immortals that never grow old, so you can store them indefinitely and create giant armies from small cities. I’m currently implementing a city-support system where armies belong to cities and impact their demography to renew their troops as they grow old, which will fix this exploit. The worldmap after the fall of Krusar, largest city in the game but smaller kingdom with only 3 regions. 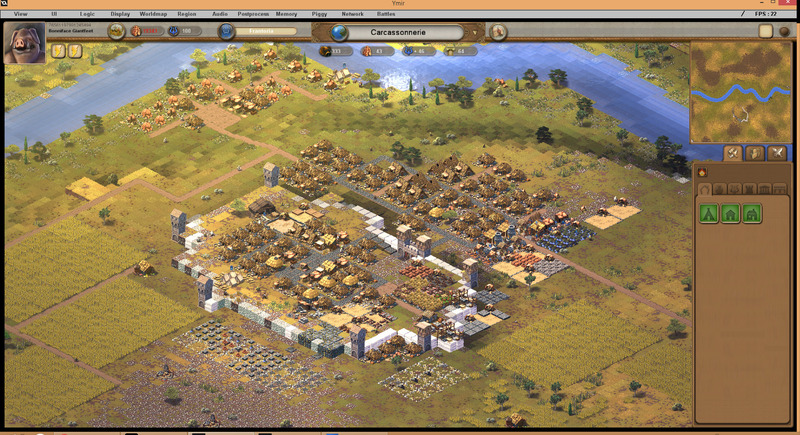 I was in the middle with Carcassonnerie beeing my main city. Current events inform you of battles happening right now, or stats being dangerously slow. Events can also inform you of past events, especially required for “persistant” game modes where you need to see what happened as you were offline, obviously. The event system also includes choice events, where you can choose between different options with different effects. The main events UI looks a bit like an email inbox where they’re organized into categories. 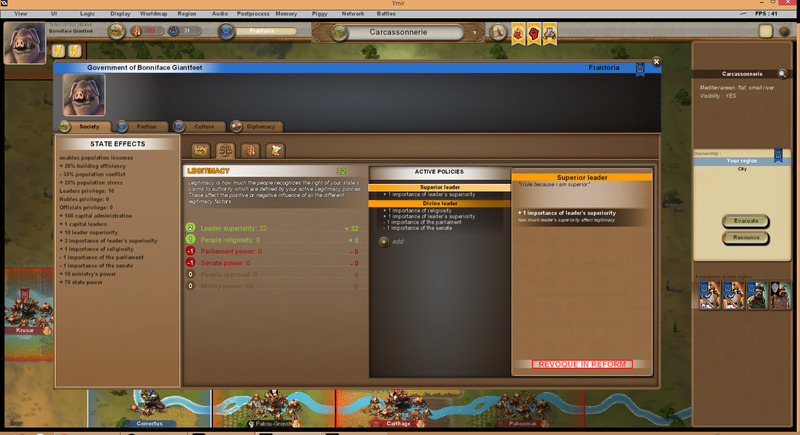 They also popup in the game UI as little flags in the fashion of Europa Universalis. This is also where diplomatic messages and treaties will arrive when players message each other. I’ve also started connecting stats and implementing process in order to make players lose the game. The first major one is Region loyalty, which is now fully connected to other stats and effective: regions with low loyalty now trigger popular uprisings. Depending on the loyalty ratio, a portion of your population will rise as rebels, and a portion of your local garrison will defect to their side. They deploy randomly from any housing buildings and try to take over the city, which if they succeed becomes an “anarchic region” that you lose control of. Testing the rebellion system based on the test game save file : because of the size of their kingdom, many of the cities of Pokie are now rebelling. Here rebels are fighting off loyalists. Loyalty of regions is connected to State power and state Legitimacy. State power is affected by the number of cities you own or the debt you have. That means that now, expanding too much and having a debt can make you unstable and you can lose the game by having all your regions rebel against you. Through an event you can decide to cancel your debt, but it triggers even stronger rebellions by greatly lowering the loyalty of all regions, although temporarily. That gives you a chance to survive if you manage to overcome the crisis. I’ve also improved a bit the clarity of the State power and State legitimacy UIs.